Showcasing some of the best resin sheds 7×7 feet, comprising fascias with enduring weatherproof manufactures and styles to compliment a garden’s outlook, this selection receives an encouraging set of feedback. After our previous wooden hut fell victim to weather-rot after the yearly cycles of laborious upkeep work involving re-coats of varnish & replacing crumbling panels, we opted to supersede wood for resin in order to sidestep maintenance hassles, providing a casual pressure-wash down instead. Initial considerations were to replace with the metal variety however after listening to friends concerns regarding sweaty interiors, the absence of a built-in floor and the flimsy lightweight panels being subject to dents rather swayed our decision towards the chunky resin style. There’s an abundance of inexpensive single skinned storehouses on the market however this article concentrates on the more substantial resin constructions reinforced around a steel infrastructure to enhance sturdiness. One thing to bear in mind whichever style floats your boat, it’s imperative solid foundations such as paving stones, wood decking, concrete or substrates such as tarmac & asphalt are laid perfectly level prior to stationing. Those who conform to the manufacturers guidelines generally provide reassuring feedback. The panels align plumb accomplishing a straightforward assembly. The perpendicular stance overcomes leaning pressures. The doors vertical alignment generates a flawless swing. The floor is able to survive ongoing demanding storage pressures. Attain rigidly anchoring the shed down to defend against the gales. If low-maintenance, UV protection & weather-resistance impress, I hope you find this recyclable selection useful for your 7×7 ft search. Each title links to their in-depth review where you’ll find additional imagery & more detailed information including inside/outside measurements along with videos showcasing their features. Cascade’s fascia exhibits a picture perfect vanilla shade, two-toned with stoney coloured doors and topped off with a slate-style roof. 7 ft across the width, 7 feet deep and in excess of 8 ft high. Suncast’s method regards blow moulding polypropylene, whereby the fascia sheets are formed into reinforced multi-layered panels simulating the charm of a wood-panelled building on the exterior side and braced with a series of resin ridges for stability on the interior. During construction, each wall panel interlocks with the floor’s perimeter simultaneous to interlinking with adjacent wall sheets followed by securing with screws. 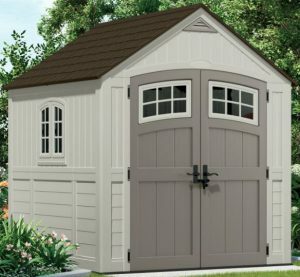 Easy Bolt Assembly constructs Cascade sheds. You’re provided with a screwdriver comprising an Allen key head for driving in the custom designed resin screws that connect & fasten the fascia sheets together. This straightforwardly approach of installation satisfies assemblers. A steel beam provides extra reinforcements to the roof structure whereby the double-skin panels are molded to resemble conventional slate tiling. A steep angled pitch leading up to the roof peak effectively drains rainwater whilst a generous overlap conquers internal leaks, overcome by the walls abutting underneath. Interconnecting the floor with the walls keeps the interior clear from leaves meanwhile intensifying the manufacture with substantial toughening helps endure the challenging pressures of weighty lawnmowers. Inside it’s tall enough to walk around without ducking down besides providing the advantage of storing lengthy gardening tools. Absent from skylights, Cascade’s design invites daylight through one wall window and both door windows meanwhile air-vents incorporated front and back distribute fresh air to the interior. Double doors generate a broad entryway whereby each door comprises 3 metal hinges to function a more robust swing. Dead bolts incorporate on the internal face of the left hand door meanwhile traditional handles contain a through bolt for closure and a padlock clasp for locking up. Amalgamating the deep rich tones of wood with weather-resistant polypropylene manufactures Fusion’s composite range where the presentation gratifies traditional desires along with the modern armoury of enduring resin. It’s effortless to clean meanwhile ascertains immunity from rot & corrosion. Three sizes of shed complete the Fusion family. This particular storehouse extends 7½ ft wide by 7 feet deep accompanied by a lofty 2½ metres ceiling height. The UV stabilised composite moulds to produce two skins, connected together by a series of internal ribs in order to suppress dents meanwhile formed at the edges with tongue & groove borders streamlines assembly by efficiently slotting & sliding into position. The apex and wall sheets secure onto Fusion’s metal framework meanwhile the roof support is additionally reinforced by a centred A-frame steel beam spanning across the apex inside, intentionally designed to support 100 kg/sqm of snowfall. Manufacturing the roof panels to exhibit this eye-catching 3D slate effect is accomplished using state-of-the-art molding techniques meanwhile the high pitch effectuates an immediate rainwater discharge system, overlapping the walls to prevent seepage inside. Fusion’s integrated floor panel barricades pests from entering & helps maintain clean internals meanwhile supplementary strengthening produces a muscular bed that tolerates burdensome tractor stresses. Air Vents incorporated front & rear generate freshness to the interior to combat saturation developing in clammy conditions meanwhile a full length skylight accompanies the windows in the walls & doors to bask the interior with natural light. Twin charcoal beefy doors open-up broad access, a stainless steel locking system improves latching performance & security measures meanwhile the handle accommodates a padlock for locking up. Fusion’s composite walls additionally cater for screwing into, enabling fitting shelves for light storage and beneficial for organising gardening tools – a unique advantage for a resin style shed. Establishing a prominent position in the USA, Lifetime manufacture stylish high-quality low-maintenance outdoor storage solutions that compliment home-yards meanwhile reassuring feedback matches their vast sales. This facility represents their popular 7 ft square storehouse. The manufacturing procedure entails molding High Density Polyethylene to produce dual skinned fascia panels whereby the inner skin is rigidly formed to impede dents & provide robust backing whist the exterior side is where a semblance of horizontal wood-panelled styling is created, radiating the warmth of desert sand shade. Likewise, the roof make-up constitutes durable polyethylene whereby the resin is formed into a chunky double skin further to simulating shingle style roofing. Each wall & roof panel secures to the steel infrastructure with quality-grade screws supplementary to the roof sheets being additionally shored up by 2 A-Frame trusses spanning the apex breadth. The roof structure comprises a steep apex gradient in order to reciprocate lofty headroom expanse inside and prevent rainwater puddles evolving on top meantime the roof sheets extend beyond the fascia walls whereby the creation of eaves vanquishes leaks-in at their abutment. Inside there’s in excess of 6 feet ‘floor-to-truss’ height plus additional headroom above. Daylight basks the interior though the full length roof-light and both polycarbonate windows. A constant stream of fresh air circulates the interior through opposite facing air vents positioned above the doors arch. The anti-slip floor encases the facility by interlocking with the walls to prevent the outside environment blowing gusts of debris inside. It’s robustly designed to survive substantial lawnmower pressures & unaffected by damp settings meanwhile resistant to solvent & oil stains makes wiping up spillages a cinch. Twin high-arched polyethylene doors containing steel meshing generate broad access whilst full length hinges function their swing. Two internal deadbolts situate on the internal left hand door, a pad-lockable through-bolt latch enables closing & securing whilst two easy-grip handles containing a press button operate the metal latch system for entry. Oakland sheds ooze charm displaying their rustic weathered appearance meanwhile impressive feedback flows through reviews. This facility relates to Oakland’s 7.5 x 7 ft Shed. DUOTECH™’s pioneering manufacture unites UV protected polypropylene with resin talc producing stylish eye-appeal, enduring weather-resistance and customizable options. This groundbreaking design surmounts dented appearances by firstly manufacturing the fascia panels into 2 separate sheets, then joining them together by a corrugated centre section, producing reinforced rigidity meanwhile the sublime silvery pigments and innovative molding method simulates the rustic guise of textured weathered wood to the look & feel. The walls simplify construction through their tongue & groove design whereby they slot into situ, slide to align & rigidly secure to the framework meanwhile up above, the roof’s infrastructure is supplementary underpinned by a steel beam, stretching out as a roof rafter across the apex width. Oakland’s imperishable roofs are designed strong enough to support 100 kg/sqm snow-loads. Their polypropylene manufacture molds the panels into a double skin whilst artistically creating a classic slate effect to the exterior side meanwhile ascertains decay resistance in order to sidestep future roof replacements. The interlocking wall-floor design determines a clean environment by enclosing the shed from pests, rainfall & outside debris meanwhile extra toughening strengthens the thickset bed to survive the enduring tensions of lawnmowers. A skylight embedding the roof ridge accompanies the squared Victorian style window in delivering daylight inside meanwhile there’s no associations of feeling hemmed-in thanks to the steepness of the apex delivering over two metres of height. Unlike Duotech’s Artisan down below, Oaklands are absent from ventilation grids, worth noting if you live in a warm climate. Double strapping doors manufactured form durable polypropylene operate the stainless steel latch for access meanwhile a handle comprising a padlock clasp effectuates security. Innovation through DUOTECH™ design caters for decorating a splash of colour to transform the looks with easygoing acrylic emulsion paint. 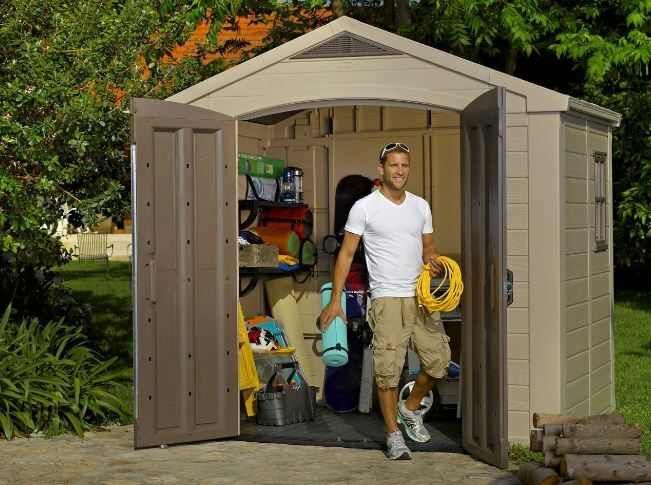 You can drill, jigsaw and fully customise the shed to suit personal preferences such as hanging items & installing shelving etc meanwhile comes with 10 years of Oakland’s weather-resistant warranty. Keter’s 7 x 7 ft Artisan constitutes the equivalent Duotech manufacture as the Oakland up-above albeit comprises an elegantly stylish pent design that modishly enriches garden settings with a sleek brushwood impression. The roof is raised at the front and slopes down an adequate gradient towards the back to ensure rainfall drains away with immediate effect. The roof expanse comprises 3 sheets of ever-enduring, impermeable, black shaded polypropylene. The roof framework regards an arrangement of supports running full length front to back. The roof sheets slide into grooves contained within the supports and overlap the fascia, producing a smart design that surmounts internal leaks. Captivating interest concerns how much more robust Artisan’s pent roof structure is compared to Oaklands already strong apex design, virtue of incorporating a steel bar system that runs up both walls and braces across the roof framework, doubling reinforcements to 200 kg/sqm of snowfall support. This roof bar method advantageously opens up extensive headroom space on account of the Artisan being absent from lower lying rafter trusses meanwhile in preference to wall windows & skylights, high windows surrounding the roof structure comprise a sleek triangular shape, bespoke to the sloping sides. Skylights soon become dirty whereas this method stays sparkly for a whole lot longer. Cleaning involves swiftly polishing with glass spray once the dirt appears. Surpassing Oaklands absence of ventilation, Artisan incorporates triangular shaped grids at the end of the window sections on both sides. Facing each other, they generate continuous air circulation around the interior to overcome saturated walls when clammy conditions persist. The Artisan integrates the same muscular floor uniform to Oakland’s method plus the doors & latching systems are identical. The only downside concerns the amount of screws included to construct but hey, what’s a day’s worth of installation. Factor sheds are purposely designed robust yet priced to suit most budgets. 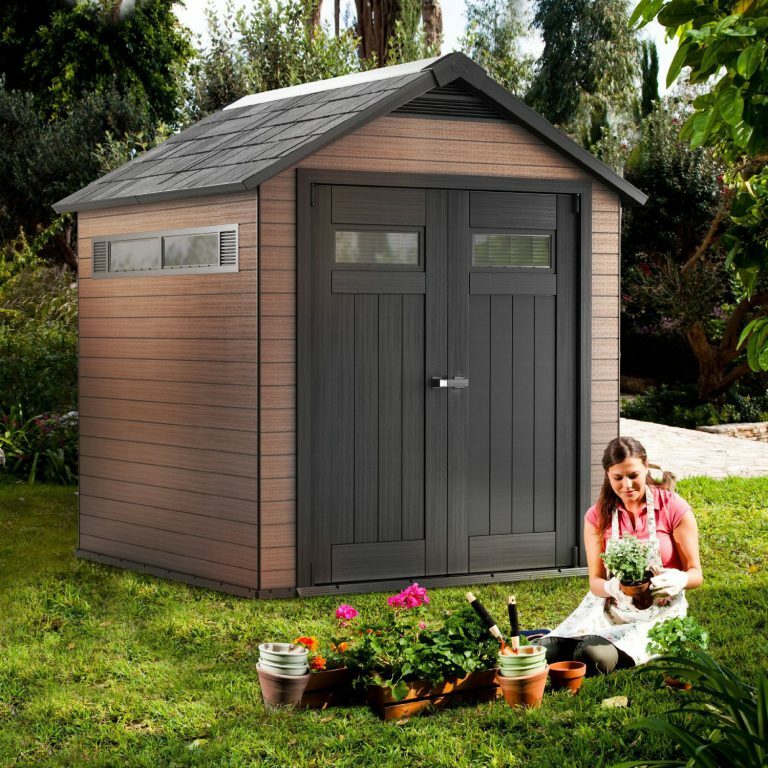 Their neutral styling compliments garden settings however they do lack in quality finishes in order to remain as one of the most competitive resin sheds on the market. Each of Factors 6 sheds making up the range have acclaimed global sales in their own right meanwhile they predominantly receive exceptional feedback from those who accept fair value for the quality of construction. Here, we’re reviewing Factor’s 8 ft wide by 6 ft deep shed. Recyclable polypropylene constitutes the make-up whereby the molding procedure forms chunky resin fascia panels, designed to exhibit attractive matt beige tones resembling a wood-panelled construction embossed with coarse grain texture meanwhile this modern styling favourably escapes yesteryear’s cheesy glossy plastic looks. The walls fascia panels encase the shed by interlocking with the floors edge whist interlinking with adjacent fascia sheets and abutting underneath the roof overlap. Feedback usually remarks how sturdy these sheds construct. The apex roof incorporates an adequate pitch to ensure rainwater promptly flows off meanwhile on account of the roof design extending beyond the shed walls, issues concerning rainfall gaining entry where the walls connect are overcome. Inside the shed there’s no cramped over feeling, a generous internal height enables comfortably walking around. Once inside, a light & airy atmosphere unfolds due to daylight basking through the window in the wall and skylight meantime a throughput of air circulation generated by two ventilation grids creates a fresh atmosphere. The floor’s integration with the walls encloses Factor sheds from the outside elements. Substantial toughening to the floor’s rot-resistant manufacture subsists the stresses of weighty storage including rolling in heavy lawn-equipment. Two shelves are included with this model. Access is broad & generous, aided by high arched double doors meanwhile a security deterrent is accomplished by slipping a padlock through the clasp & locking both doors simultaneously. 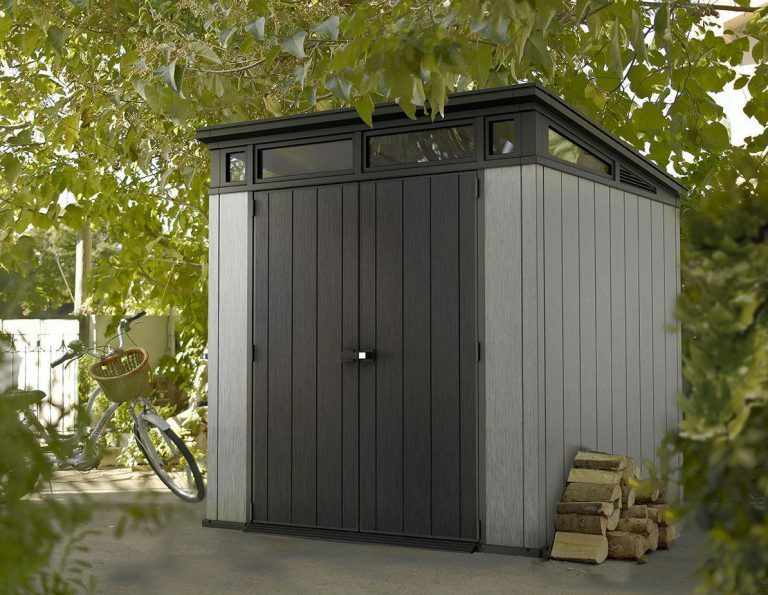 These recyclable low-maintenance and conservation-free sheds only require a wash when dirty. Innovative molding methods nowadays produce robust structures showcasing stylish displays to complement garden landscapes meanwhile their weather-resistant advantage puts an end to rot related issues. Shed Sizes displays various sizes of low maintenance storehouses displayed in size order. Each shed photo links to their review. Hope these 7 x 7 footers have provided plenty of inspiration for your garden ideas. 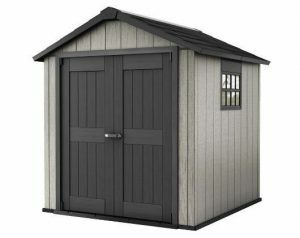 Share you preferred 7 ft sq shed below along with any relevant queries. Pleasure to assist. Please share these 7 footers. Thank you. Your website is informative and very well presented. 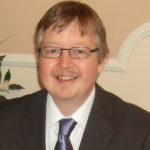 I have left a comment on your website, the sheds look really nice, unfortunately, I have a brick shed so at the moment not in the market for one. My son made resin sheds for a living but the resin got on his chest so he had to change his job. Well done like it very much. 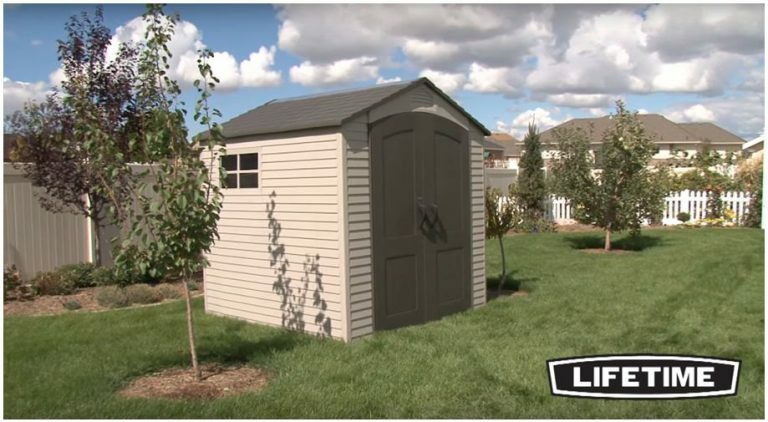 Hi Pam, thanks for dropping by to read about the different styles of 7 by 7 ft resin sheds encased in a weather-resistant design. If I had a brick shed, I wouldn’t be in the market for a resin one either. The cost of building a brick construction besides planning permission etc doesn’t warrant the cost for most of us. These resin styles merely deliver convenience in storing all our outside gear in a protectively sheltered environment. This website concentrates on alternatives to wood, for those looking to escape the hassles of wood rot and the continuous upkeep demanded in order to preserve. UV protected resin sidesteps conservation issues, being resistant to the consequences weather & damp causes when stationed outside long term. Sorry to hear about your son’s issues with resin, I’m guessing working in a close environment to the manufacturing process may cause issues, wow, hope he’s okay. When constructing ours, neither of us became chesty albeit we were outside in the fresh air for 3-4 hours whilst assembling. My parents live in a development that only allows metal or resin sheds. My dad likes to work in his shed so we need one he can insulate and put in some benches. He wants a 10×12. What would you recommend? We live in Kansas. Hey Tracey, thanks for messaging your query. I’m not sure about metal sheds over in the USA. In the UK we have a company called Asgard who engineer heavy duty galvanised steel into very secure storehouses meanwhile their top coat comprises a polyester powder coat finish which enhances their endurance to weather attack. So maybe a search near you comprising a polyester finish may suffice if metal is your preference. When I first read you query, I immediately thought of both Lifetime’s 8 x 12.5 ft shed and the Suncast Tremont 8 x 13 ft due to their sheer popularity besides receiving exceptional feedback, then I noticed you mentioned insulating. The trouble will fixing installation against plastic walls is finding an insulation or method that will adhere to resin, if you have a solution maybe either of the previous sheds mentioned may fit the bill however if you’re after a resin that caters for screwing into to accomplish securing, the following sheds maybe of interest. Oakland sheds cater for customising from painting, securing screws into and jigsawing but in order to fix to the walls you require Duotech D-Clip wall anchors. Oakland sheds are fairly new to the market and I am currently struggling where you can acquire the wall anchors. I would ask this question to the Oakland shed seller prior to purcahse. Fusion sheds on the other hand are a mixture of wood and polypropylene that exhibit traditional looks which cater for screwing into their walls but you would have to check with the development whether they allow composite sheds. Thank you for a great article. It is wonderful to see a variety of quality resin garden sheds. We have wood termites in the area, so resin is a better option than wood for me. 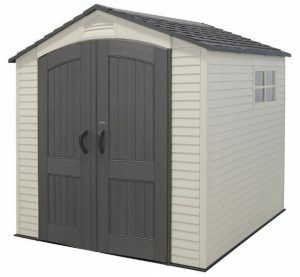 The resin garden sheds are stylishly designed and will look great in any garden. I love that they are spacious enough to store all the garden equipment and other tools. Thanks for dropping by and reading about this selection regarding 7ft x 7ft resin storage sheds. Resin certainly counteracts the problems of decay to which termites, woodworm and other pests deteriorate outdoor wooden manufactured products, overtime when stood outside due to the weather elements and pests living within, wood requires constant maintenance. We’ve just spent the last month’s weekends trying to service our wooden fence, everything was living within, rotting the fence to bits. 3 fences and 2 wood posts replaced, every top replaced and many of the wood supports have had to be replaced due to wood rot, reminds me of the upkeep problems we had with our last wooden shed. Overtime it’s an ongoing problem to which resin resists. Yeah, there’s some very attractive looking plastic sheds entering onto the market at present, escaping that glossy plastic look with pure style. 7×7 ft is a popular size as they fit most garden plots without being over obtrusive yet adequately large enough to hold a whole host of outdoor gear. We’ve managed to make more room in the home and clear the garage by accommodating all our gardening equipment and patio seating etc outdoors in the shed now whilst having the peace of mind regarding a structure wrapped in weather-proof resin is safeguarding storage. Hi at the moment i am looking for a new shed and the choice is huge, i have narrowed it down to resin or plastic shed. I am pulling towards the Cascade 7×7 shed, i like the colour and it looks very well, i like the idea just to wash down the shed every year. My only worry is the colour and the weather and specially in the summer with the sun, i was wondering will this product fade over a time ? And would this be a issue with the resin sheds? Thanks for calling in and reading about these various 7×7 ft quality plastic sheds. 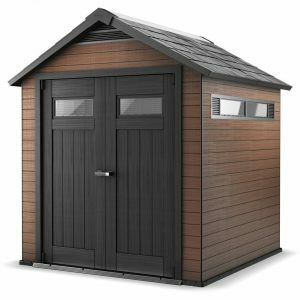 Your maintenance problems regarding the constant upkeep of your wooden shed sounds like the process I went through before demanding an escape route due to the yearly hassles. Resin too was my choice as it’s effortless to keep maintaining the pristine finish. A pressure-hose down once a month usually suffices, a role I quite enjoy too. 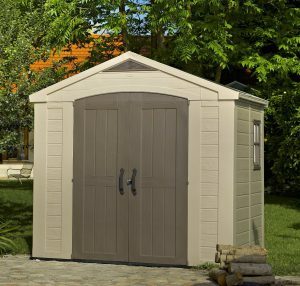 The Cascade is a Bonny shed, the pastel shades of Vanilla wrapping around the stoney coloured doors and curvature square windows look sublime, this really is picture perfect to go along with the low maintenance values the resin make-up beholds. All these sheds I review here are UV stabilized to prevent cracking and fading in the sun, technical advances have now evolved to add these elements that resist fading into the polypropylene resin mix. I haven’t yet reviewed a resin shed that doesn’t resist colour fading. I liked your article on the resin sheds, they all appear to be attractive and function well for what i am looking for. How does one choose from the different material sheds, do you think the resin ones are better than the plastic ones? How about aluminum shed, where do they rate among resin and plastic sheds? 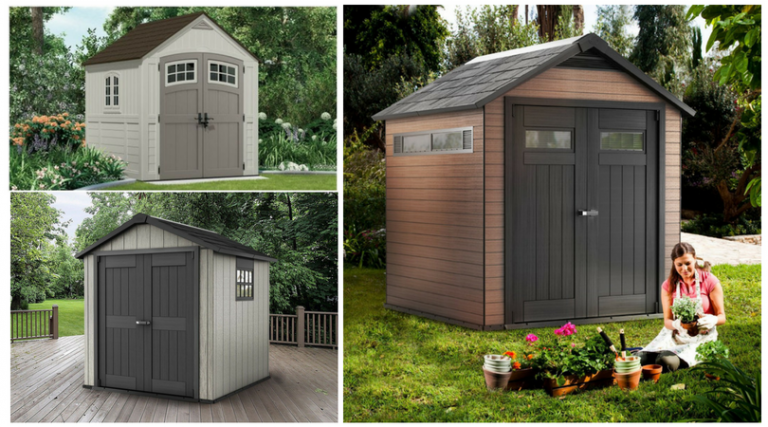 Thanks for stopping by and reading about these various resin sheds. There is no difference between resin and plastic, they’re the same thing. Resin is plastic however there’s some very stylish models entering onto the market at present replacing that glossy plastic look with superior designs like the Oakland and Fusion sheds. 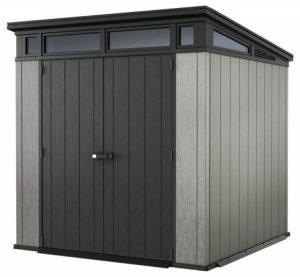 You’d never think some of the new models were plastic yet the resin mix manufacturing these sheds provides durability and weather-resistance advantages critical for storage preservation whilst retaining their easy-to-clean surface. Wood sheds look sublime but after a while decaying problems start to set in and they require constant maintenance unless you opt for treated cedar wood which is very low maintenance but demand an extremely high price. Metal and plastic sheds entered the market to counteract this problem. Metal and Aluminum sheds are great and they used to be more secure however the new style of resin sheds are now counteracting this problem with reinforced steel incorporated within their door structure. The reason we decided upon resin regards: They’re weatherproof, durable and easy to clean, resist rot and rust, whilst not prone to denting, no sweaty internal atmosphere due to built-in air vents, double door access and a built-in floor creating a clean internal environment. Everyone has different views, this is what swayed our decision. This website is designed to introduce some of the new resin styles of garden sheds entering the market for visitors to inspect. I really love your post! Full of detailed information and well organized. I bought a plastic shed for the first time about a year ago, since my new house doesn’t have a garage. The information you provided could is very helpful. 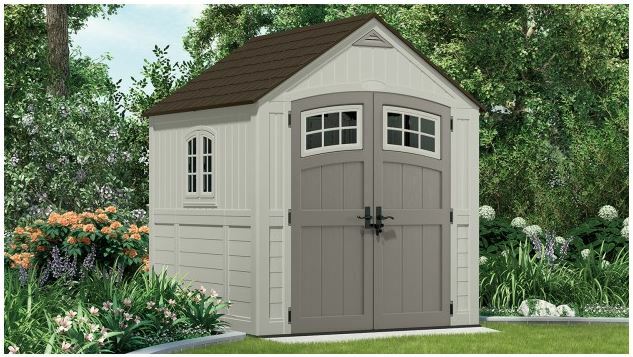 Can I find this type of sheds in department stores? or only within their manufacturer? Thanks for calling in and reading about these quality plastic sheds around the 7×7 ft size. 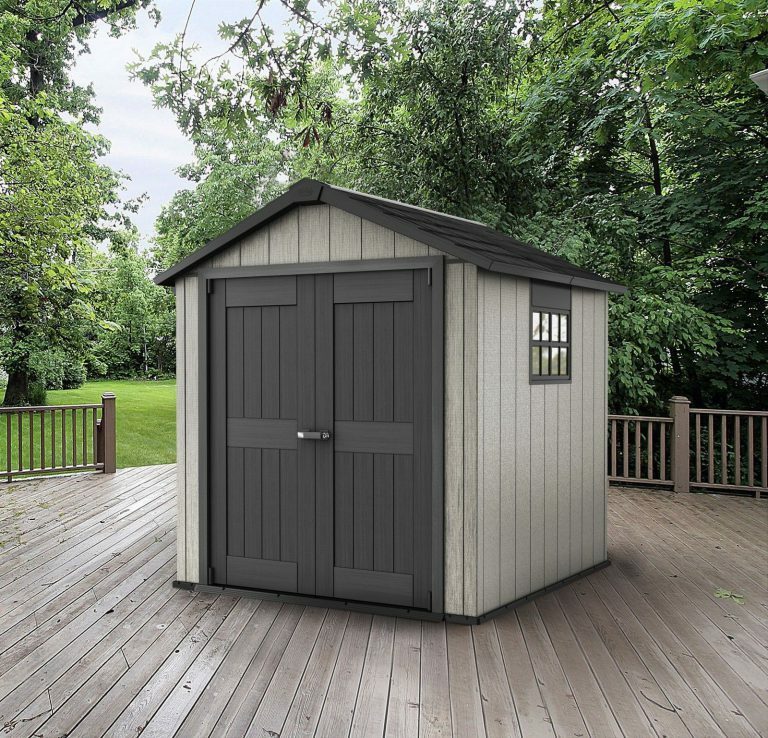 A shed is an ideal investment to organize the home especially when there’s no garage for harboring outdoor gear enabling you to make more space in the home and store all the outdoor stuff outside. 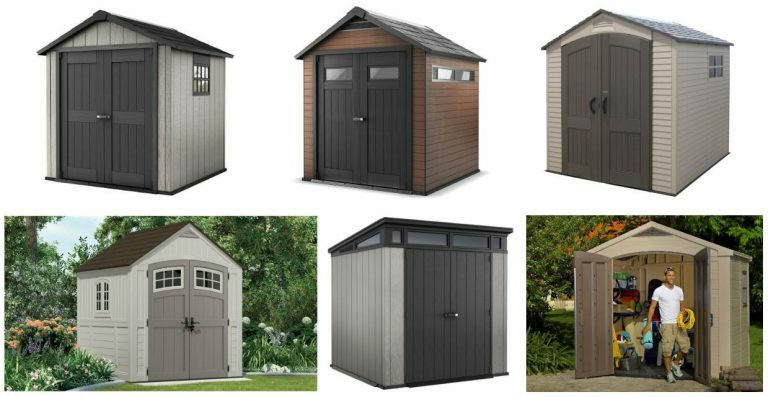 I’m glad you found the brief synopsis regarding these 5 quality resin sheds chosen helpful, the links provided take you to full reviews where more information, images, videos and internal measurements present full indepth knowledge for each particular style of shed. The problem regarding sheds displayed in department stores is their huge size, reason they’re seldom seen. This is the reason I insert all the images available and videos of each particular shed within my in-depth reviews for visitors to take a full inspection. Now and again you do see the odd deck box or small horizontal unit however the choice maybe only the odd one whereas a website can show the whole range and take inspiration from feedback presented in reviews. The odd manufacturer do sell their own however you find the majority of sales are created through the large online stores or garden shed and garden websites.